This is the first book I've posted under two categories - Memoir and travel. I do love books on New York and this one is no exception. 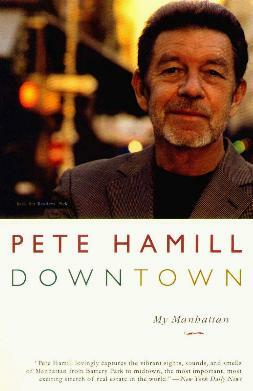 Ex-newspaper editor of the New York Post and New York Daily News, Pete Hamill, was born in Brooklyn, moved around a bit, and returned to Manhattan where he lives and works. Having intimate knowledge of a city so revered, respected, and loved, but also scary and intimidating such as New York City, is surely grist for many a writer. Each time there are different aspects a writer will concentrate on, and many times one will not see what the other does, hence the many books on or about this awe-inspiring place. Mr. Hamill has a fluidity about his account which makes for easy, interesting, and page-turning reading about "his" downtown in Manhattan. It's a compelling read as Hamill tells the history of New York - easy to follow and it all fits into place - unlike other confusing "historical" accounts I've come across. From the late 1700s and through the 1800s and 1900s, so much exquisite change flourished in the then, and now, ever-growing city of New York. He not only covers the buildings and streets and avenues, but also the many peoples (the Dutch, the English, the Germans, Russians, Italians, Irish, and so many more) who so long ago had a huge hand in shaping the city. He also talks about the birth of the entertainment industry and the start of vaudeville among other arts and arty places of interest. You truly feel his passion for this special part of the world. Conclusion - Fabulously interesting and well written.